DC series is a versatile signal distribution and amplification platform for cinemas. DC series presents a new approach to cinema system design. Based on many years of experience in cinema installations, it features smart, efficient design while providing innovative options for brand new theaters. 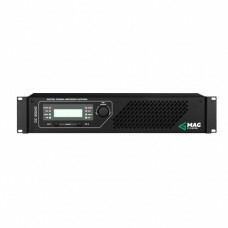 Based on energy-effective and lightweight class D amplification with switch-mode power supply, DC series offers a complete power range to fit a cinema installation of any size. Followed by a modern DSP, remote controll via dedicated software suite and avaliable in “A“ versions digital AES/ EBU input capability, DC series is easy to integrate and use in modern automated cinema delivery systems. • Operation capacity into 4 Ohm, 8 Ohm and bridged connection provides wide range of wiring for different cinema channels and theatre sizes. • DC series is supplied with database of ready speaker presets for MAG Cinema systems, further reducing tune-up times while ensuring better protection and trouble-free operation. • Dedicated Theatre Control software suite, available for free from manufacturer’s website, serves as control centre for entire theatre sound installation, providing userfriendly interface for tuning, controls, monitoring, and preset management. • Networking-enabled DC 600AE, DC 1200AE, DC 1208AE and DC 3000AE versions can be used to create and control a group of amplifiers for direct connection with cinema server. Along with control inputs for TMS integration, it allows building a cinema sound system without additional speaker processor.